We are a market-leading firm engaged in offering Power Resistors to our valued patrons. These power resistors are highly efficient in performance as these are manufacture by a team of skilled professionals equipped with latest technology and modern tools. Offered resistors are fabricated in compliance with international norms and standards. These resistors are well tested for quality at various levels by a team of qualified professionals ensuring superior quality outcome at customer’s end. Customers can avail customized resistors from us as per their needs and requirements. 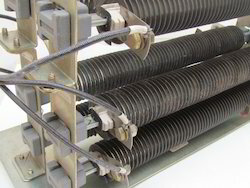 Our organization is known for manufacturing and exporting highly reliable Industrial Power Resistors. We provide well-tested resistors to our customers by checking them for quality through various tests. These resistors are developed by a team of dexterous professionals, aiming at the optimum satisfaction of our valued patrons. Manufactured in strict compliance with international standards, these resistors can also be customized as per the needs and requirements of our valued patrons. Looking for Power Resistors ?